The Griffin public house can be traced back as far as the early 17th century when it stood as the largest public house in the village of Isleham in Ely, Cambirdgeshire. The Griffin occupied a large timber-framed, 16th century house much like the building that remains today in the centre of Isleham. During the early 1600’s The Griffin appears to have been primarily used as an Inn, providing temporary residence for up to 12 persons. In the 1800’s (approximately 1861 to 1871), Mr Thomas Williams owned The Griffin. It changed hands a number of times during the years and by 1930 The Griffin was styled a hotel. In 2008, Michael and Gina Missing became landlord and lady of The Griffin and since this time have undertaken some refurbishment work on both the interior and exterior. In 2010, the restaurant was launched suitable for up to 30 people alongside an open log fire. 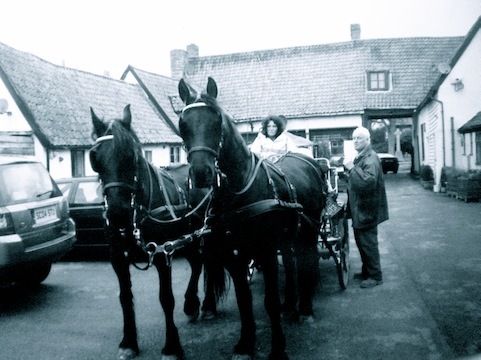 In 2009, filming for film Wreckers commenced in Isleham village which many scenes shot within The Griffin. We are very proud to have been involved in the production of the Wreckers film and look forward to seeing the finished product in 2011. Further details of the film can be found here. The appearance of The Griffin, we believe has changed very little during its 400 year history, and we therefore take pride in preserving this historic landmark in the village of Isleham.